Hidden in a corner along Duxton Road, finding this cafe was no easy feat, especially with its dull and dark exterior which did not give the impression that it was a café. 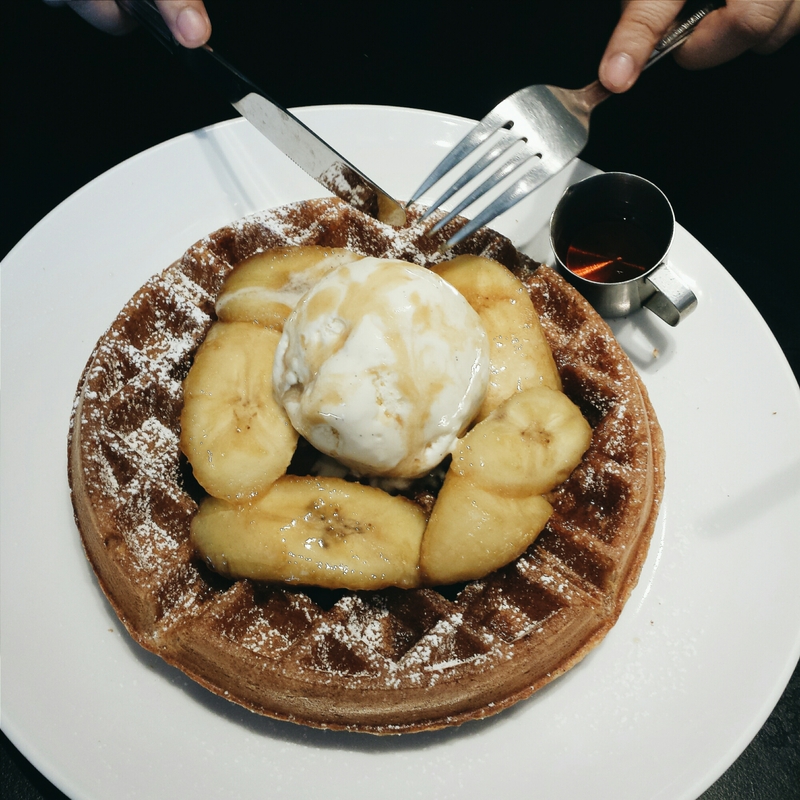 However, Department of Caffeine (D.O.C) has a clean, cozy atmosphere which is perfect for lazy days when you just want to spend the rest of your day there. Prior to coming here, my friend had called to make reservations for 1pm. Having lost our way, she called them, saying that we’d be late. The guy on the line was very nice and told us that he’d wait for us. Thumbs up for service! 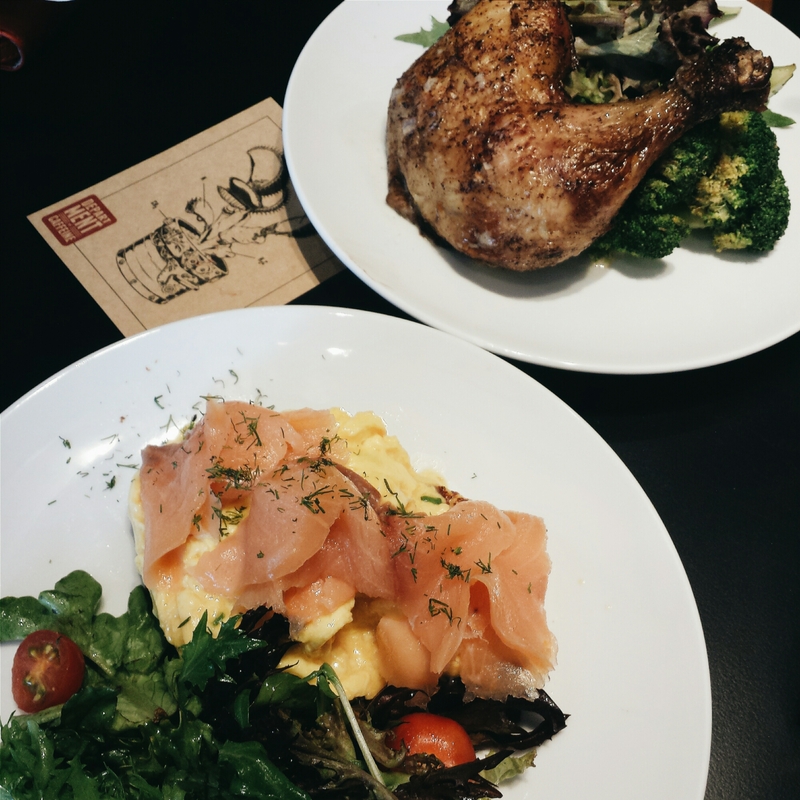 The menu is pretty extensive, offering a wide range of food, from the usual breakfast foods to main courses like Roast Chicken and Poached Salmon. Popular items are the D.O.C. 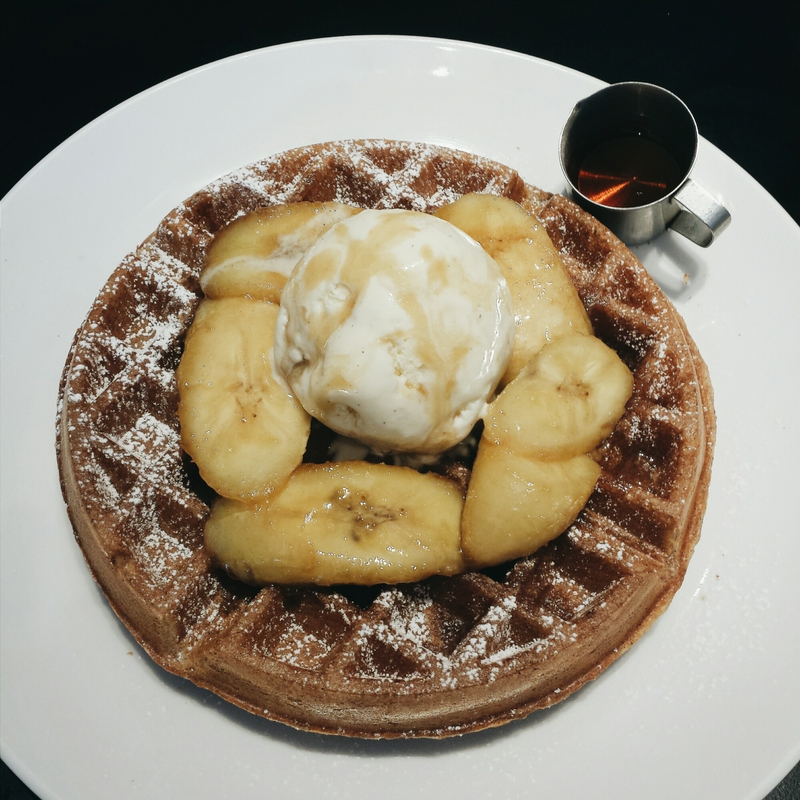 Breakfast Platter – which comes served to you on a wooden board – and Buttermilk Waffles with Butter Rum Bananas and Vanilla Bean Ice Cream. For the drinks, we shared an Iced Chocolate ($8). There was no ice so I’d say this drink is worth the price because it also came with a scoop of the Vanilla Bean Ice Cream and was very rich in chocolate. It was a bit too thick to drink it on its own so we waited for the ice cream to melt for it to mix with the chocolate drink. The scrambled eggs were cooked just right – creamy and soft. The smoked salmon was a bit on the raw side which I didn’t like, but that’s to my preference. Unfortunately, the toasted english muffin was overdone and it was too crispy. On the other hand, all the ingredients came together in perfect medley and complemented each other very well. I didn’t try the salad so I can’t comment on it but the chargrilled broccoli was good. I love love broccoli and they were generous in their portions. 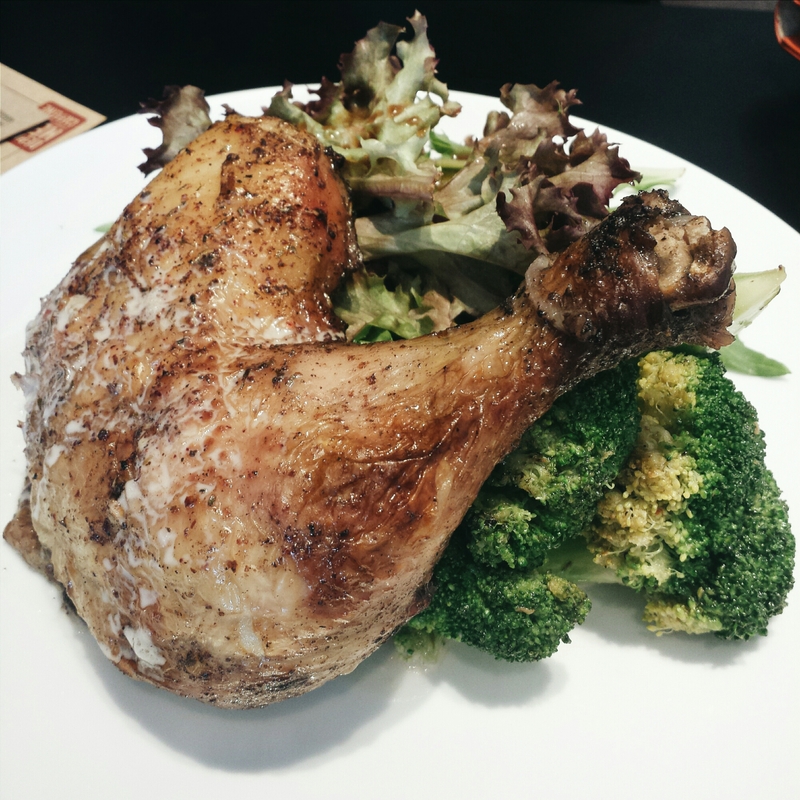 The roast chicken had crispy skin and the meat was very tender. It was so succulent, juicy and all the other adjectives you can think of to describe the best roast chicken. This dish is also bursting with flavour and I totally recommend getting this because it is also a cheaper yet satisfying item. You can’t imagine how long we took to take pictures of this. Surprisingly, the ice cream didn’t melt very fast. 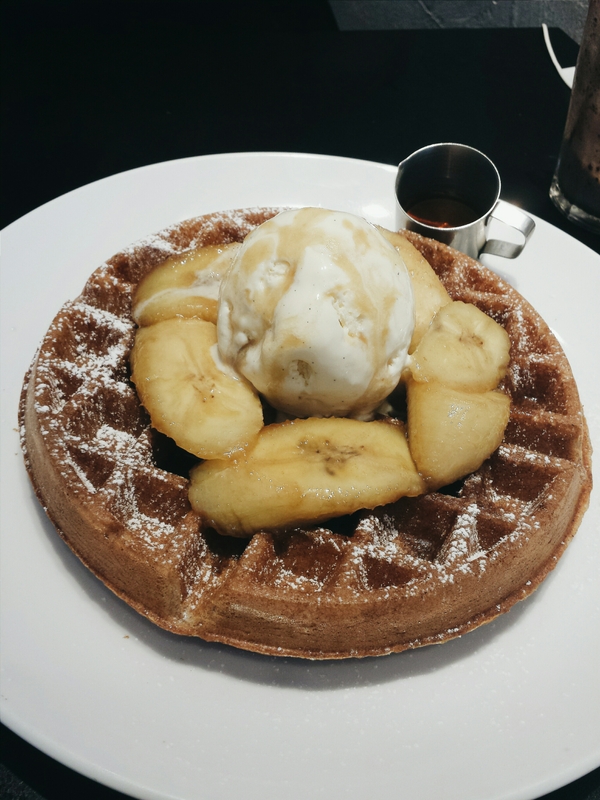 Additionally, the waffles were done just the way I like them – crunchy and the inside light as air. Despite that, they didn’t stay crispy for long and became soft quickly after we began eating them. I think the batter also had a strong cinnamon taste which I quite liked and thought it went well with the butter rum bananas. The bananas were smothered in an irresistible butter rum sauce, were firm and not too mushy. This is dish would be great for those with a sweet tooth and is the perfect way to end off the meal. 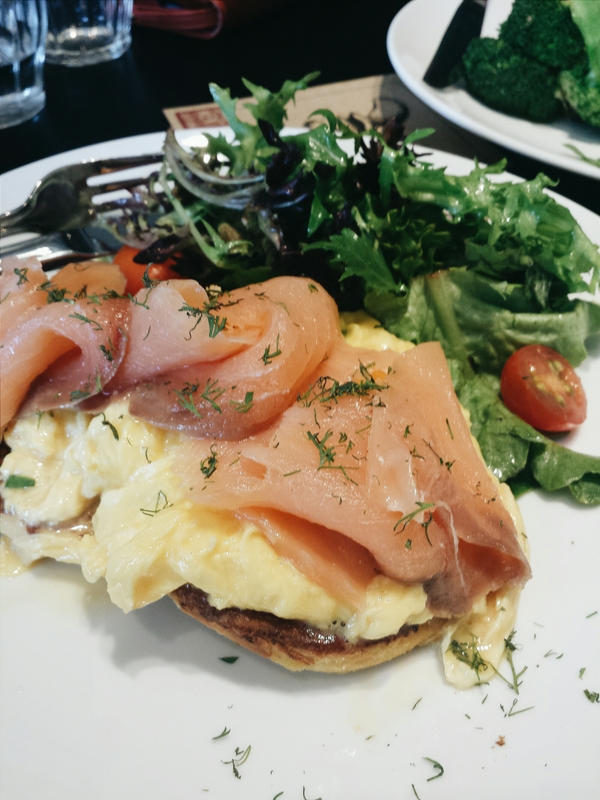 Overall, this cafe is ideal for a good hearty brunch with good company! In my honest opinion, I would totally revisit this cafe to try their poached salmon and churros. Better yet, it has no GST and service charge.